There are some things you can’t learn in a classroom! When in the course of educational events, it becomes necessary to blow off a little steam and hoist a few, here is the book you want committed to memory. The outrageously fun drinking games included in this complete compendium run the gamut. Some use props such as quarters, cards, dice, Tupperware, or your body, while others are especially designed to be played far from the table (and out of harm’s way). 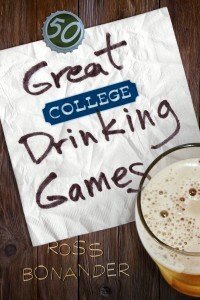 Written by a college drinking game connoisseur and appropriated from all parts of the country, here are 50 games of skill and chance to be played when you are: a) waiting to get sober, b) waiting for another round, or c) wondering when those bozos will stop hogging the video games. And, yes, we have to say it, because it’s true, drink and have a good time – but drink responsibly.